Bucktown is widely known for its hip art scene and trendy urban atmosphere. Home to dozens of art galleries and several art festivals held annually, Bucktown houses more artists than any other region in the Midwest. Bucktown was once home to the working class industrial workers of nearby factories; but since then, these living quarters have carefully been converted into stylish, urban studios, upscale loft residences and modern condominiums for young professionals and local artists alike. The boundaries of Bucktown and Wicker Park are actually so fuzzy that the two neighborhoods are often combined and referred to as the Wicker Park/Bucktown area. However, the official dimensions almost form a triangle-like shape with the Chicago River, Western Avenue and Bloomingdale Avenue acting as the main borderlines. Bucktown Chicago real estate for sale is filled with vintage style apartments, traditional brick bungalows, and newly rehabbed condo buildings. The vintage style residences are certainly appealing to many young professionals and artists, but the amount of newly developed modern condominiums in Bucktown continues to rise each year. Most vintage Bucktown units are reasonably priced as a traditional 2 bedroom condo will most likely be in the mid- to upper-200’s. Like anywhere, newer, more modern style condos tend to jump in price but can be found in the upper $300,000s to lower $400,000s. Currently, the average sales price for a Bucktown condominium is right around $268,000. The high concentration of trendy boutique shops, vibrant bars and restaurant and loads of art galleries and music venues has transformed Bucktown to a top Chicago destination for both residents and visitors alike. Every August, over 30,000 people attend the Bucktown Arts Fest creating an awesome atmosphere around the neighborhood. In addition, every block seems to have its own neighborhood corner tavern--making this area especially attractive to the younger generation. A perfect example being the Map Room Tavern; opening as a coffee house at 6:30AM and doubling as a tavern by early evening, this unique and stylish watering hole, located at 1949 N. Hoyne Avenue, is filled with bookshelves of traveler’s guides and atlas’s, making this traveler’s themed drinking establishment among favorites of Bucktown residents for years. 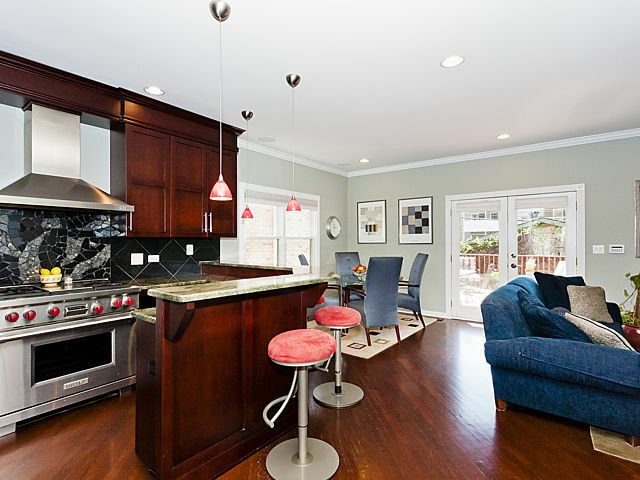 See What Makes Bucktown Real Estate So Popular Below! Bucktown is a lively and trendy part of Chicago’s west side. Often associated with neighboring Wicker Park, Bucktown is full of hip bars, restaurants, style boutiques, and several great music venues. Real estate for sale in Bucktown is without question on the upside, so an investment here is not only safe, but should provide a great return. For more information on Bucktown real estate for sale or to schedule a private showing, contact our team of real estate experts today!